Combine nostalgic steam train travel with tea and cake for a late summer treat. Customers can travel back in time on a beautifully restored steam train and enjoy a pop-up vintage tea experience at Amersham station on the weekend of 10th and 11th September 2016. Delicious tea and cake presented on charming vintage crockery will be served on the station platform by ‘Jam and Tea’ staff dressed in vintage floral pinnies and country tweeds for steam day-trippers who have purchased a special combined tea and steam event ticket. Music from the 1940s will add to the atmosphere while children will have their own paper tea sets, tasty treats and a range of drinks to choose from. Tickets are limited for this special event so those wishing to sample this unique tea are recommended to book early. On Sunday 11th September passengers can take a free heritage bus ride from Amersham Station to Amersham Old Town where the town’s annual Heritage Day is taking place. Expect live bands and performances, market stalls, a children’s area and fairgrounds. The steam train will be pulled by Met No.1, which was used during the 150th anniversary celebrations of the London Underground, and L150 on a journey to or from Amersham Station. 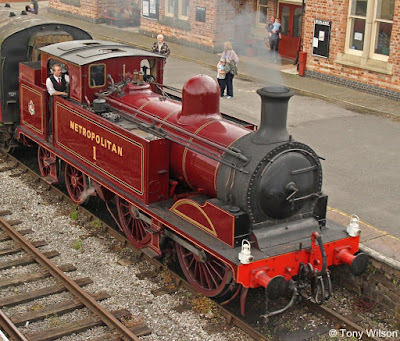 Tea and Steam ticket: additional £10 for adults and children (3 – 16 years old).